Here’s an article submitted by Jitendra Rathod, newsletter contributing editor. The term “decentralization” isn’t new. It is almost two centuries old, but never has it been used with such vigor and interest as it has been in the past decade. The invention of Bitcoin and the subsequent explosion of cryptocurrencies created a paradigm shift in the financial markets, and while the underlying blockchain technology was picked up by entrepreneurs and developers to disrupt the status quo, the tangible and tradable cryptocurrencies attracted financial enthusiasts (read=traders) who energetically took to trading in this novel and exciting asset class. To satiate the needs of crypto traders, many developers created cryptocurrency exchanges, akin to traditional stock exchanges, and irony died a thousand deaths. The literal mushrooming of “centralized crypto exchanges (EXs)” is like a dagger in the heart of the crypto philosophy. Imagine trading decentralized cryptocurrencies on a centralized platform. If it seems counterintuitive, because it definitely is! DEXs, or decentralized exchanges, though few in number, are seen by crypto purists as the true torch bearers of the movement. Let us take a quick look at these two types of crypto exchanges. Centralized Exchanges are platforms which are controlled centrally. All the trades and transactions which occur on a centralized exchange are mediated by a handful of “authorized” people, much like how traditional finance works. Decentralized Exchanges also operate similarly to a centralized exchange in many ways, the only difference being that there are always peer-to-peer dealings instead of a mediator being involved. Although the front end of the exchange is managed by a group of people involved in the making of the code, the trade of currencies isn’t interfered with and is always dealt between the two parties involved. Many people turn toward EXs due to the amount of liquidity they offer. The trades on EXs are a fraction of a second faster than those on a DEX. Although it doesn’t make a difference for ordinary traders, the ‘high-frequency market makers,’ who regularly deal on the platform, are affected by this minute difference. Otherwise, DEXs are at par with EXs when it comes to the functioning and operation, and just as reliable as the latter, if not more. The major benefit of a DEX is that since there is no involvement of a third party in any of the trades taking place on the exchange, all the funds are only accessible and controlled by the owners. This not only provides greater security to traders, but also curbs hackers who are drawn more towards less immune platforms like EXs. On an EX, you don’t “own” your crypto assets; they are held by the exchange and you have to trust them to keep them safe. But if you see the growing list of EXs that have been hacked, you can well realise the dangers of entrusting your funds to them. EXs also control which tokens to list and which not and also decide on the amount they charge for listing. This, to, is counterintuitive, and, dare I say, counterproductive. DEXs are more private but can be overwhelming for new players. You are responsible for the custody risks of your assets. DEXs aren’t bound by the stringent AML and KYC compliance requirements. Many DEXs offer only basic crypto exchange functionality and not the whole paraphernalia of trading tools often offered by an EX. DEXs, however, offer complete anonymity, another important tenet of the crypto revolution. DEXs are faster, cheaper, less susceptible to malicious attacks and offer seamless integration with users’ personal wallets so that funds are always in complete control of their owners. One of the major differences between an EX and a DEX from the government perspective is that EXs will, and can, thrive only in crypto-friendly countries. Countries that do not look favourably upon cryptocurrencies will, and have, ban(ned) EXs. Take the case of China, which has banned EXs from operating within the country. EXs can still function in such countries, but if the governments have created roadblocks, EXs will find it difficult to function. India hasn’t banned cryptocurrencies, per se, but doesn’t allow banks from transacting in crypto. This stops traders from cashing out their assets through their bank accounts. This has led to many EXs shutting down, or relocating, in recent months. DEXs, on the other hand, are distributed worldwide, since they aren’t hosted on a single server, in a single location. That is to say, a DEX is not country-specific. And hence, no government can intervene in the working of a DEX and cannot, legally, shut it down. For an EX to function, it needs to have the appropriate operating licenses from government institutions and are, in turn, regulated, by them. Again, because a DEX is distributed worldwide, it is immune to governmental institutions and regulations. An EX needs to disclose its physical location and its ownership details. DEXs need no such declarations to be made. User accounts in many EXs are insured. DEXs do not provide any insurance and you are responsible for your own funds and the risks associated with their custody. If you lose your funds, nobody is going to give them back. Different countries have started bringing DEXs under legal purview. In Australia, for instance, under the Australian Encryption law, DEXs could be blocked and denied access to unless regulated by the developers. Most other major countries, do not have DEX-specific laws, but may bring laws to (somehow) regulate DEXs. Currently, DEXs are less popular than EXs, however, so as long as DEXs remain outside the ambit of stifling regulations and are closer to the decentralized spirit of crypto and blockchain, they offer clear advantages and are an attractive alternative to trade crypto assets. 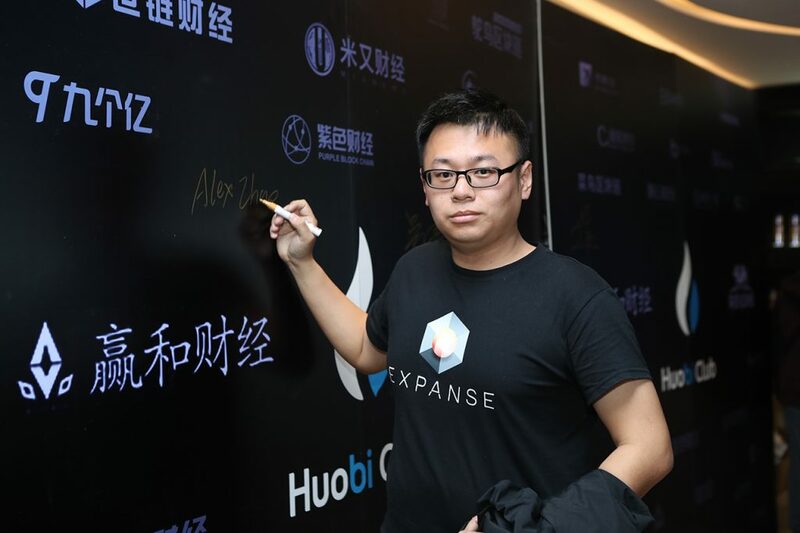 Our team in China has taken the Expanse show on the road. Over the past few weeks, the team has attended more than a few meetups and conferences. How does the media survive in crypto? The team is currently putting together a plan to host their first meetup. More about that to follow. The last time you heard from us we were preparing for demo day in San Francisco. 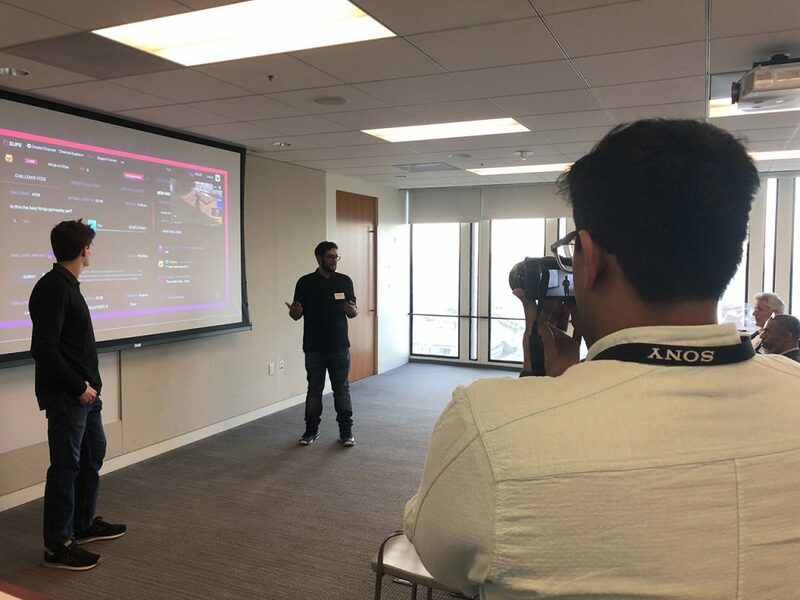 In under a week we had prepared a brand new pitch deck and rehearsed an absolutely dynamite pitch for a room of peers and potential investors. Along with the other six start-ups in the cohort, Slips shined and was able to impress everyone in the room. We have designed and implemented a brand new feature into Slips. A calendar is about to be unveiled where Slips streamers can schedule and advertise their very own events and streams. It’s not just any old calendar; streamers can customize their posts with a range of colors and images and have their event or stream featured on the front-page of Slips! You can now see who the high rollers are on the Slips platform. A leaderboard has been created to show the pecking order on a wide variety of braggable (or even shameful) achievements. Slips members can now see the top ten of who has the biggest balance of Slips, most bets won, most bets lost, biggest bets, most subscribers, and who has the most badge points. If a Slips member is at the top of the list, they will be granted an exclusive badge for the leaderboard achievements. We are always listening to our community to make the Slips platform even better for gamers and streamers alike. One of the key points for streamers using Slips is that they have to monitor multiple chats in order to engage with their audience. 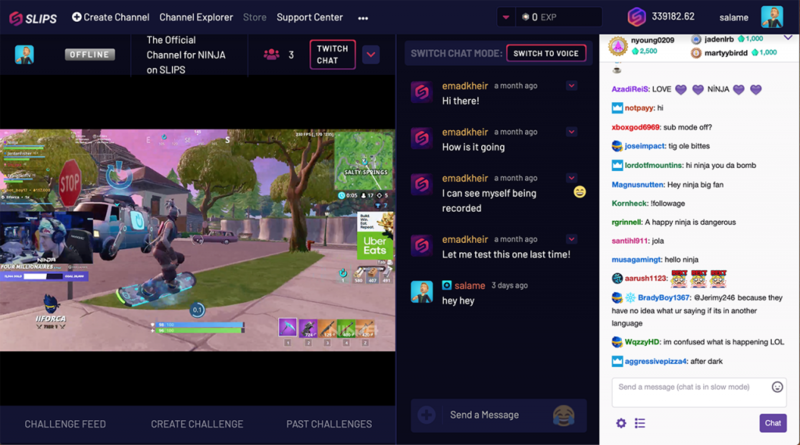 We reacted quickly and our MVP developer Emad created an ingenious solution to embed Twitch’s chat directly into the Slips channel. 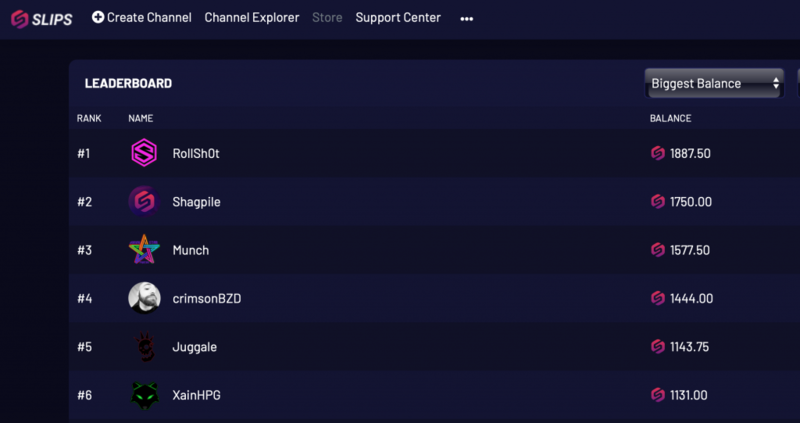 Now streamers monitoring Slips challenges can easily manage the two chat feeds on one screen. In preparation for this release, we are working on an aggressive marketing campaign. The product is now at a place where we can be a competitive force, and we will put more energy into getting the word out. Luna Wallet v2 was released last week with great reviews. Tokenlab is now integrated, along with a new EXP price indicator, user interface enhancements, and miscellaneous bug fixes. Monitor the Luna Wallet Discord channel to follow the discussion. UKYC development was put on hold temporarily while we tackled other priorities. It has resumed this week with a vengeance. In addition to the actual development work, which is making great strides, we have embarked on the development of an investor pitch deck. UKYC has the obvious potential of creating greater efficiency and security in the Know Your Customer processes we use in crypto every day. Once it is ready to market, we plan to position it with corporate sales groups as an added-value utility they can market with their enterprise software products. Completion of the investor pitch deck will allow us to approach our contacts with this opportunity. This high-priority initiative should be ready for QA testing next week. Last month the Bittrex Exchange and its affiliated sites took Expanse offline for maintenance. Much to our dismay, we learned that Expanse was hit with a 51% reorg attack through no fault of its own. A 51% attack is when an attacker controls 51% of the total hashrate and uses that power to rewrite recent transaction history. Note that here was no loss to Expanse-holders, and the chain was secured and back up within a few days. Many new people joined the Expanse Discord community, now with 2255 members. Numerous ongoing lively and interesting conversations were sparked in regard to the future and potential of Expanse. The channel was literally buzzing 24 hours per day. Members who had been away for awhile returned to voice support and encouragement. Updates were put into place making it impossible for Expanse to suffer another 51% attack. We implemented PirlGuard, further securing the platform from threats. A few days after the maintenance, someone tried to hit Expanse with an 80% attack and left empty-handed, reinforcing the security of our platform. The code is that strong. Our lead developer, Christopher Franko, conceived of a completely new, never-before-used mining algorithm that is completely unique to Expanse. It is called Frankomoto, and we plan to release it in the May timeframe. Start Immediately. 10K EXP Bounty. SummaryImplement XIP3 (formerly EXPIP3, also known as Constantinople) changes into the Parity wallet. At block 1860000, enable all of the Constantinople EIPs. If (XIP2 aka Byzantium), blockTarget is 30. If (XIP3 aka Constantinople) is enabled blockTarget (duration limit) is 15 instead of 30. Update the source to rename expip* to xip*. Qualified applicants, please email us at [email protected].